It maintains a set of default options like general ledger accounts; locator, lot, and serial controls, inter-organization options, costing method, etc. 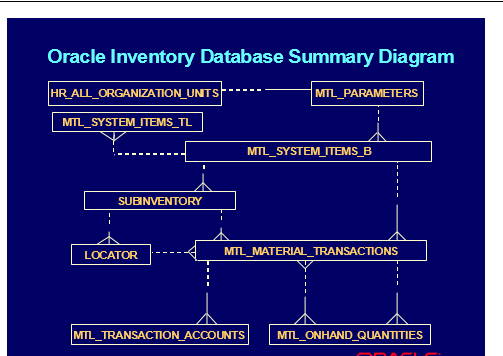 for each organization defined in Oracle Inventory. Each organization’s item master organization (MASTER_ORGANIZATION_ID) and costing organization (COST_ORGANIZATION_ID) are maintained here. This table store organization information. MTL_SYSTEM_ITEMS_B is the definition table for items. This table holds the definitions for inventory items, engineering items, and purchasing items. You can specify item-related information in fields such as: Bill of Material, Costing, Purchasing, Receiving, Inventory, Physical attributes, General Planning, MPS/MRP Planning, Lead times, Work in Process, Order Management, and Invoicing. You can set up the item with multiple segments, since it is implemented as a flex-field. Use the standard 'System Items' flex-field that is shipped with the product to configure your item flex-field. 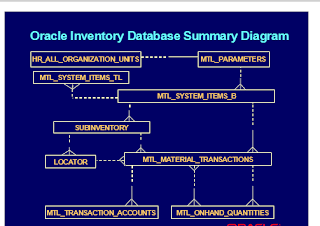 The primary key for an item is the INVENTORY_ITEM_ID and ORGANIZATION_ID. Therefore, the same item can be defined in more than one organization. You can set up the item with multiple segments, since it is implemented as a flexfield. Use the standard 'System Items' flexfield that is shipped with the product to configure your item flexfield. processor or by the standard cost update program.